Carolina Sweepers has been a customer for 15 years. 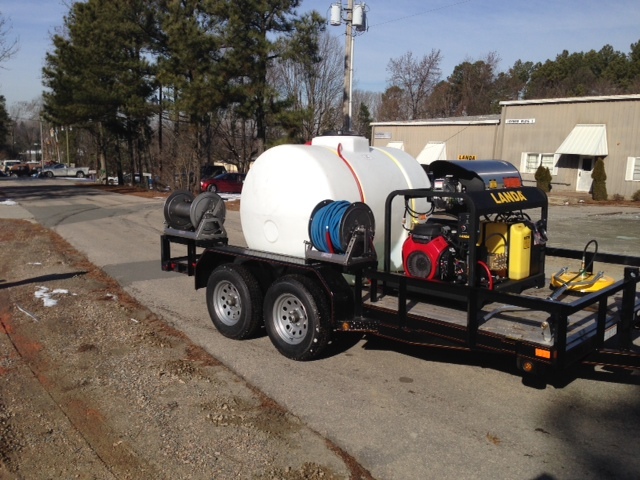 His latest trailer is the typical Landa Hot Water Pressure Washer. The PGDC5-35324E has turned out to be the most reliable mobile hot water pressure washer for us over the last few years. The Landa LT6035 pump with u-seals has been very good on repairs, often thousands of hours without a failure. Landa is making this unit for us in a 7pgm version. Bigger pump bigger motor. This trailer has the side mount reel brackets we have been using. We like to face the curb side for easy access to the house from the street. Rigsbee’s Auto Parts on 64 Hwy in Knightdale is bringing in these Moxy trailers without the gate on the back and extra cross members to support the load of the water. All recessed lights – to keep the hoses from catching – and a 7 ton jack.